1. The Rudolph Days Challenge will start each month (January to November) on the 25th, and will close at midnight PST, on the last day of that month. 2. The theme is always Anything Goes, as long as it is Christmas. 3. 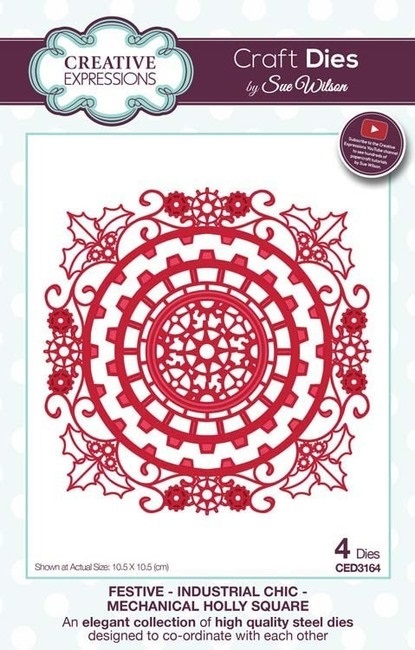 One entry per person and you just need to enter one Christmas card or Christmas project. 4. You may combine your entry with other challenges (maximum of 10 in total). 6. Please link back to or at least mention, the Rudolph Days Challenge. 7. Please leave a comment on the challenge post. 8. 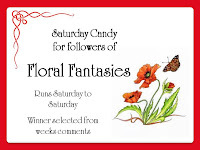 The winner will be selected by random draw and announced on the first day of the following month. Prizes will be mailed anywhere in the world. 9. A special draw will be held at the end of the year, in December, for all those who submitted a card or project every month that year, January to November. First up is Jenny at Cardsarus blog. Jenny has made us this gorgeous, shimmery white card with beautiful pops of navy blue accent colour. If you enlarge this card you will see the gorgeous shimmer even more so. The flowers are so lovely here and look good setting off the wee snowman scene Jenny has created. I know you will want to pop over to her blog and leave her some praise for this beautiful card. Jenny always finishes the inside of her cards too, so you will get a double treat! My cards this month are so plain in comparison to Jenny! I chose to upcycle two cards. I usually do this with cards I receive, but in this case I bought two boxes of new cards and envelopes at our local Home Sense clearance. At $1.00 a box, I could not resist. I then cut the front of the cards off and trimmed down the images to a usable card making topper size. Both cards were made from my snippets boxes. 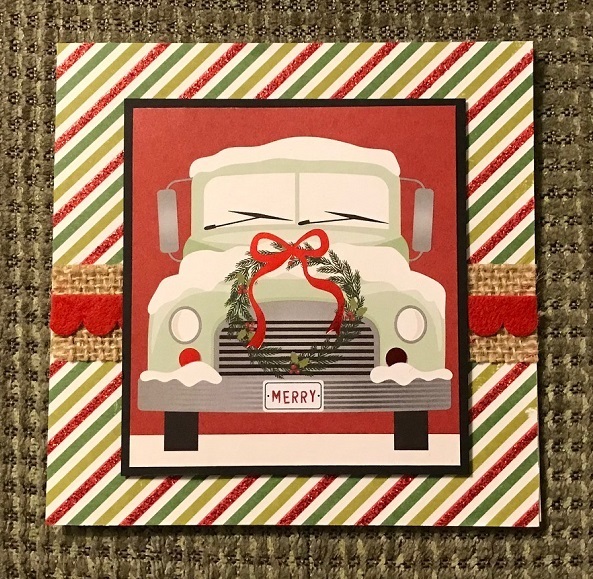 The first card with its vintage green truck was kept very simple. You have seen the diagonal glitter striped background many times before as I bought a dozen or more sheets many, many years ago when it was on clearance. 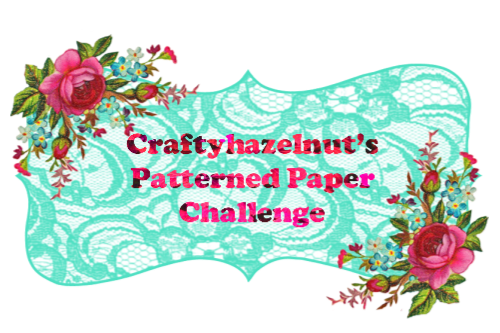 I have never regretted that purchase and in fact I love this paper so much that I save every scrap to reuse! The burlap ribbon as well as the red scalloped felt ribbon are from Michael's, and were also purchased a few years ago. I love the felted ribbons as they do not need to wrap around a piece of card stock to hide the fraying end. You just slice through with scissors or your cutter and they never fray or look at all raggedy. I think it was purchased on clearance, just after Valentines one year. A simple black mat behind the topper image and this card was done! 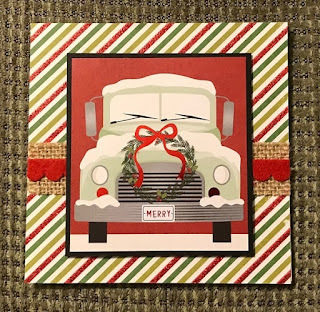 My second card is made up of the red truck and Christmas tree topper. I was so excited to find this image as our family chooses a Christmas decor theme for the for the following year, while we are savoring our desert and coffee after a big Christmas supper. Last year we chose a red truck and live Christmas tree in the truck box as our theme. I originally bought these new cards to use framed, or perhaps even as name tags on the table. but we seemed to find a plentitude of red truck themed items so these were not needed after all! |Off to the craft room they went and were fair game to be sliced up!!! Once again I used my snippets boxes and found the red DP which I thought looked sort of like hounds tooth or even plaid at a glance. The black plaid seemed to call our to be included and the kraft snowflake seemed to fit into the masculine feel of this card. Added a bit of bakers twine to the snowflake for a little punch of colour. (Both prizes were chosen for their masculine feel as I felt they were a good choice for my masculine cards this month). 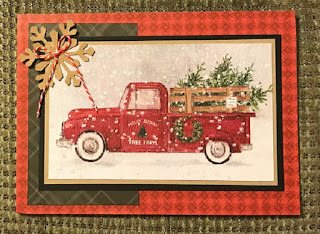 Fabulous snippets cards with the trucks!! And Jenny's card is gorgeous!! Thank you for another fun Rudolph Days Challenge. Happy Rudolph Day, just uploaded my entry - fab prizes - hoping to be lucky! Fabulous cards - I especially like the upcycled snippets cards. 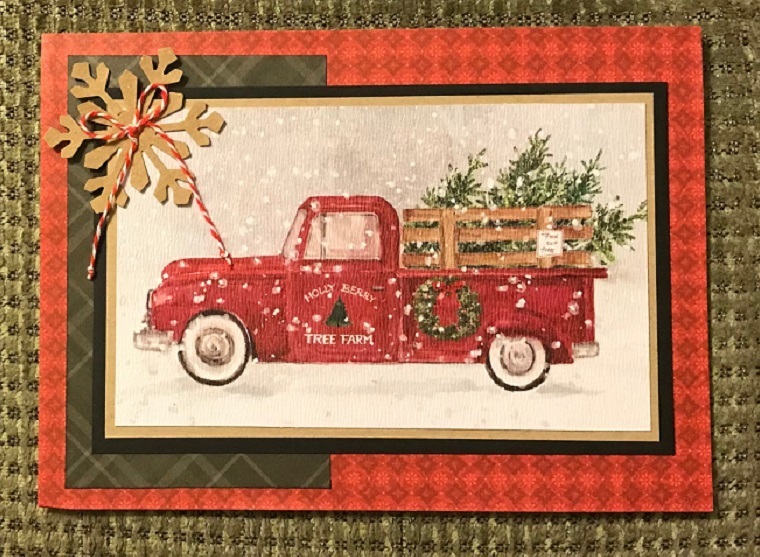 A fantastic collection of cards from Jenny and you Maureen, I love the truck cards. Hello, Maureen! So glad to see your Rudolph Days challenge! I've been making lots of holiday cards this month and I have one all ready to go - I will be back soon to link up! Your upcycled cards are gorgeous - I love to upcycle too! Great idea to pick up the boxes of cards when they are clearanced out. Jenny's card is beautiful! I love the little snowman and beautiful flowers! I think I remember that your surgery is coming up this week and I hope all goes well. Sending hugs and wishes for a speedy recovery! thank you so much for your wonderful write up on my card. I love your cards and those trucks are so gorgeous. I always feel that those type of trucks are very festive and prefect for hauling Christmas Trees home in. Love your wonderful designs they are so colourful and beautifully created. Hope you are feeling much better now. Lots of crafty love and gentle hugs. Jenny L.
Fabulous inspirations for the new challenge, love the fun and delicate feel of Jenny's card and both your creations are just perfect for masculine recipients! Great use of your snippets, too! Another wonderful fun challenge. I always look forward to the Rudolph Days designs everyone shows. Thanks to all for the inspiration! Great inspiration cards! Happy to be playing along again this month! Two or three, should I say, lovely creation from the team. I have commented on Jenny's own blog but I do not now who the second DT is but they are super up-cycled cards. Thanks so much for the inspiration. I decided to use a recycled card as well. Super cards Maureen, I love your colour choices. Super cards Mo, from you and Jenny. So pleased to see you posting, and hope the op. goes well! Wonderful samples, Maureen! 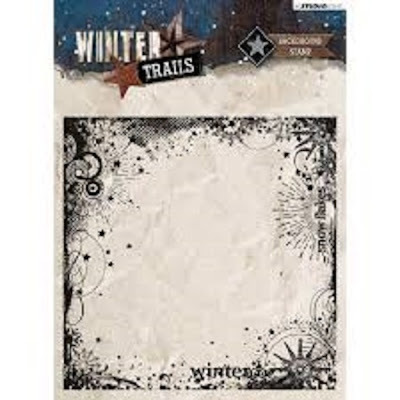 Love the masculine feel and clean layers of your own cards, and Jenny's card is so festive and shimmery. Almost forgot to link my card, but will be remedying that in a minute. Love the masculine cards you made Mo. Gorgeous cards. I love the trucks. And your dinner table was fabulous! Wonderful cards. Thanks for the challenge. I LOVE your Christmas trucks, Mo! Wonderful for a guy or a family. I loved seeing your table setting for Christmas too. I have the same kind of glasses. Thanks so much for keeping this challenge alive. It really helps to get those Christmas cards done on time. I love your inspirational cards!